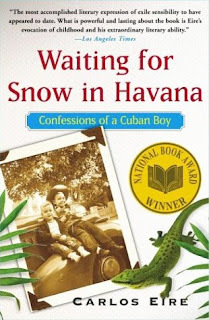 This memoir of a Cuban Boy is a must on any bookshelf. Carlos Eire amazed me with his creative, clever and humorous prose, such as his comparison of his parents to King Louis XVI of France and Marie Antoinette. I also was impressed at how much he remembered from his childhood, from blowing up lizards with firecrackers to watching his father drive through crashing ocean waves. He writes candidly and lyrically about his fond childhood that dramatically changed when Fidel Castro gained power and he left soon after for the Unites States.